Going in for another one! Was pretty surprised how nice this little rug is. For the price I expected it to be thin and cheap. I needed just something for my back kitchen door, inside. It's very well made has a nice thickness to it and I'm going in for another one to put between my hallway and living room. Pleasantly surprised. Beautiful color. I can find nothing wrong with this rug. All I can say is that it is awesome. high quality...well made. very happy with these rugs! i like the color and its just the right size for in front of my sink. 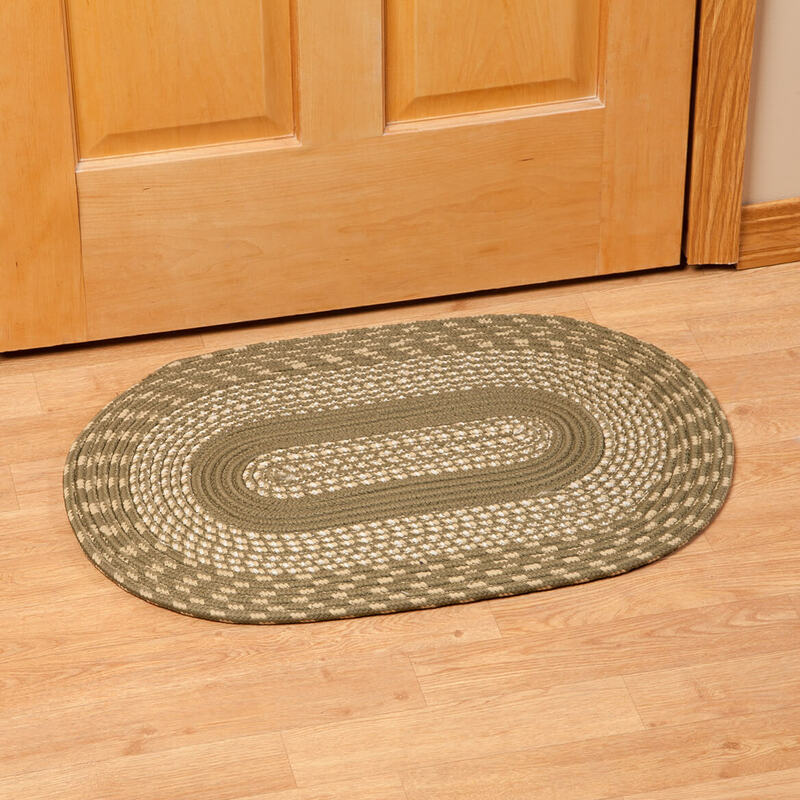 I bought 5 of these rugs in various sizes, hunter green. The colour is true, they are sturdy and well made. I would buy them again, especially at this price. I've looked at these for over two years as an option to replace my current kitchen rugs. I have wood floors in my kitchen. The greatest feature/advantage for me is when we had the wood floors installed, the clearance under our doors (inside and out) was decreased. I had a hard time finding a rug that was thin enough to clear the door and still attractive. These work perfectly. I'm glad I finally made the purchase. I would definitely use this company to order again. This was just a bit darker than I expected - but still OK. It shipped and arrived very quickly and seemed like it was of good quality. There was a lighter one I could have ordered but I chose this one so we'll give it a try and see if it lasts well. I bought this specifically for use on a wood floor underneath the coffee table (which is actually a hope chest) in front of the sofa. It looks great and feels great on bare feet. Adds color to room. Saves carpet from dirty shoe stains. These are very nice looking rugs. They look better than my more expensive ones. Nothing more to add, we are quite satisfied, Will be shopping back with you OFTEN! The rugs will be used in the living in front of individual chairs. Use in my kitchen in front of the sink and stove. On occasion I do catch my sandal on the edge of the rug, but so far so good; just have to learn to lift my feet! These rugs are well made and look really good. I replaced the rug inside my front door. This one is larger so it fills the area (width of door). Looks nice, stays in place...overall I am very happy with this rug. perfect for high traffic areas! This rug was bought to minimize wear and tear on our more expensive carpet.So far it has worked great! 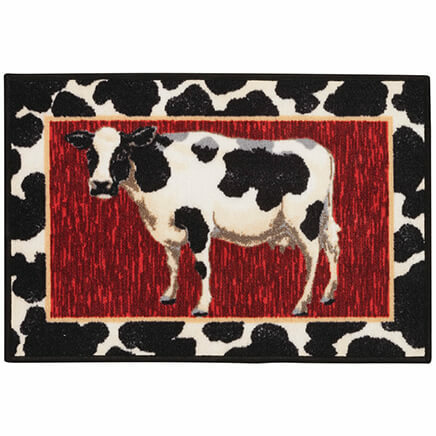 I Enjoy the rugs I have the 20-30 inch, We are using these on the dinning room table for place mats. Works great, and beautiful in BURGANDY. I work on craft items on the table and the mats keeps my table protected. Also have pets in my home and the rugs also work great in chairs, pets get up in the chairs some and protects the chairs also. I am going to buy more. These rugs are awesome. Very good quality. They really add to my kitchen. Not like regular cloth rugs. These have substance. I want more. I use these rugs in my kitchen. They match my color scheme very well and are very practical. I love them. This looks beautiful in my kitchen near the sink. Not only does it do justice to the hardwood floors in there, it also is nice to stand on while at the sink as it feels cushiony under your feet. I am going to order another one to use in the upstairs hallway I like it so well. It's just the right color and at a great price!!! Yes. I would and I have bought this item again. I bought these rugs for our lake house and loved them. Very durable. They don't slide. The edges don't curl. So I had to buy 2 more for our regular home. They are perfect for snow boots, wet shoes so dirt doesn't track. And last but not least, these rugs are beautiful! My previous rug lasted over two years in a fairly heavy traffic area at the front door. I'm surprised at how well it wore and how long it lasted. I'm replacing it but will use the old one in the basement. It still has a lot of life left in it! 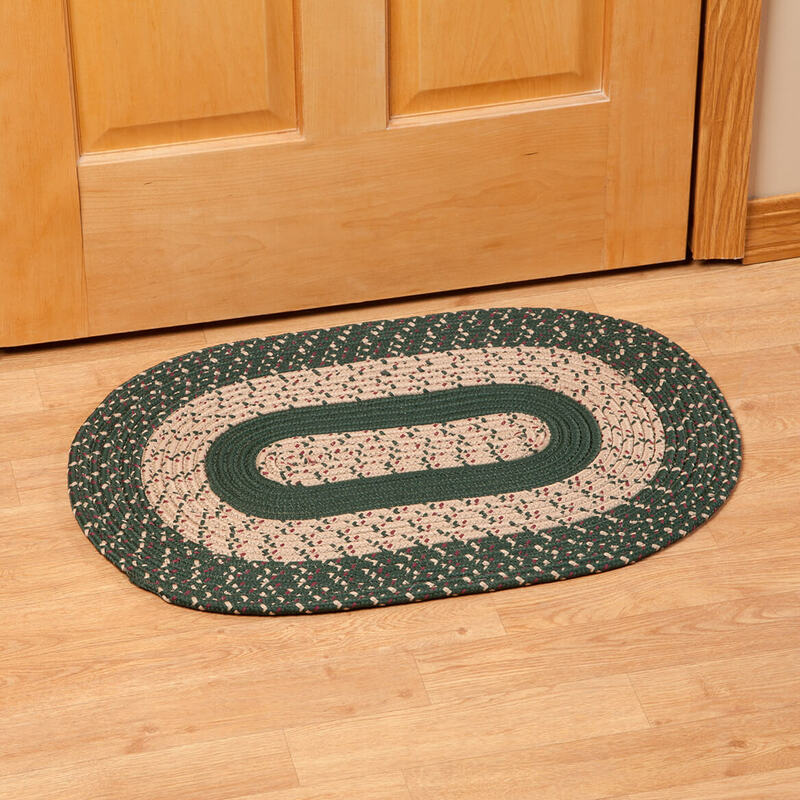 Knockout Deal on Area Oval Braided Rugs. We originally bought 3 area rugs for the living room that we were renovating,they looked sooo georgeous, we bought more for each of the bedrooms.Thanks for having such good deals on your products, so that we could finish our renovating timely, without breaking the bank. 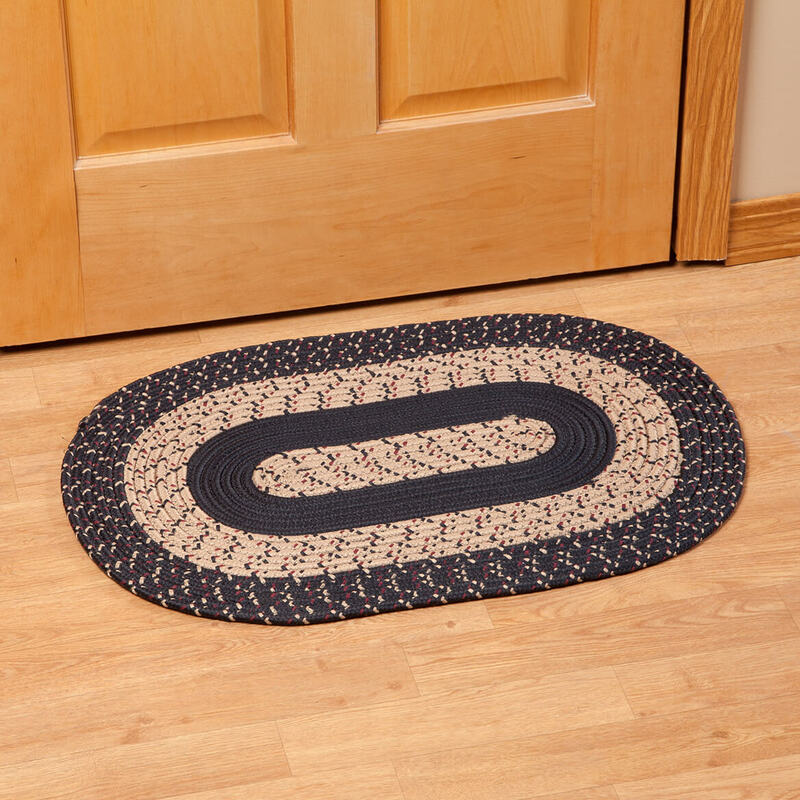 I love braided rugs and these are reasonably priced, look great, and require very little maintenance. Cat does move them around very easily, but I don't mind. I would recommend this product and buy again. 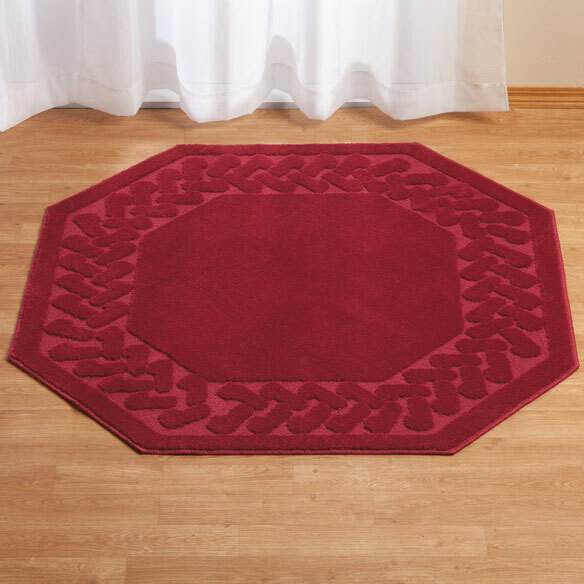 Durable attractive well made braided rug is not only a good price but comes in three color schemes and long enough to cover dirty shoes and boots ?? when coming in the door!!! Nice quality, much thicker than I expected. Worth the money. I haven't had my rugs long so I have no complaints so far. Used as runners,and beside my bed. Loved the design and color so much, I bought four of them! Vivid colors and seems to be well made. I'm hoping it will match the one I already purchased. Need a new rug in my kitchen, the price is perfect. I like a braided rug in front of my sink. It gives that area a cottage look that matches the rest of the kitchen. I like this because it will protect my hardwood floors in the high traffic areas. first time ordering this type of rug, hope it looks good. 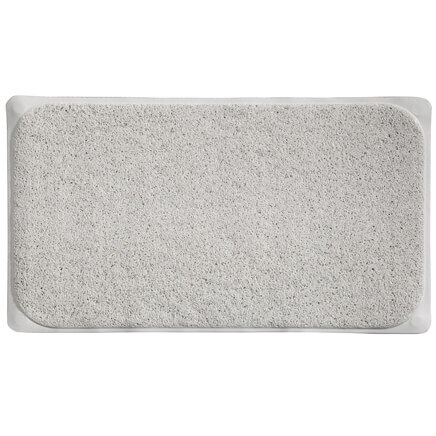 Have used these rugs before and love them. Decided to change the look. Love this and well made. Beautiful rug. The right size rug for our living room. Matches our décor. Good price: better than the other company. Bought several & love/are reversible too! Needed to place under my desk chair for smooth easy movement. I picked it for my dog. She keeps eating the foam in dog beds and costing a lot at the vet. This looks like it would go good by the bed and is not foam. Great price and I need new rugs for my kitchen. We have ordered this product in the past and have been satisfied. It is time to replace this rug after many years of wear. I have purchased this rug a while back and it is still in use!! Cleans easy, too! I like the selection of colors, I lke braid rugs! They are really nice rugs. Well made and a great price for what you get. Very good quality, wear well. I like braided rugs. I thought these would work well with a puppy! can these go in the washing machine? BEST ANSWER: Thank you for your question. It is Machine Washable on gentle, use mild soap, cold water, tumble dry no heat. We hope this information will be of help to you. I wouldn't. The description recommends spot cleaning. I believe that these rugs would come apart in the machine. No, I would not recommend it. I tried it once and they fell apart. the sage color looks more like a beige color what color is it? BEST ANSWER: hi I bought the Wedgwood color and it is true to color...... I love it and it has been holding up great! can't answer this question, I bought the blue...must have rubber underneath it...VERY slippery! It is very nice but it is more beige than sage. The photos for the Navy Blue and Wedgewood braided rug colors seem to be reversed. Isn't Navy Blue normally the darker of the two blue colors? BEST ANSWER: Thank you for your question. For the 60" x 22" they are reversed in the photo. If you order Navy, the picture will show the wedgewood, but you will still receive the Navy. We hope this information will be of help to you. Yes. The outer and middle portion is navy blue and it is darker. 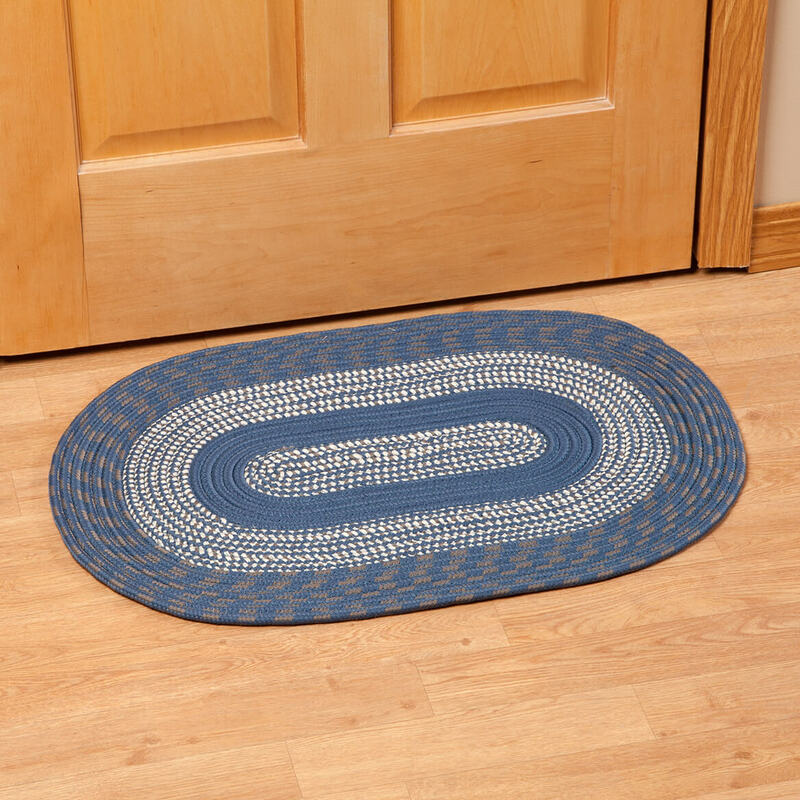 My braided rug looks exactly like this one, but in navy blue. Is that dark color in the burgundy rug blue or another color? 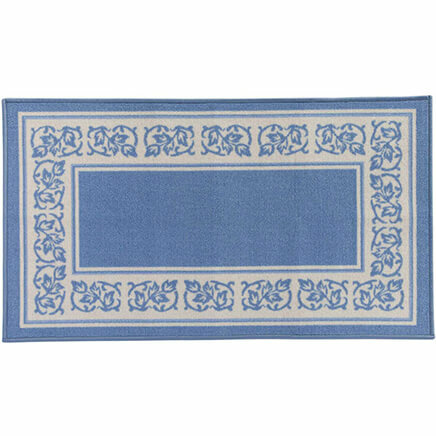 BEST ANSWER: I ordered the hunter green, the wedgewood blue, and the navy blue rug in .Each rug have a neutral color such as beige, tan or white interwoven. There were no primary colors mixed in any of the colors that I received. Thank you for your question. There is a multiple of colors speckled into the color including blue. We hope this information will be of help to you. The dark flecks are dark green, not blue. They are twined both within the beige and the burgundy. How thick are the rugs, please? What are the rug sizes? BEST ANSWER: Thank you for your question. The sizes are 30x20, 48x28, 50x80 and 60x22. We hope this information will be of help to you. Does this have another color in it other than the tan and burgundy? It looks like green may be in there? BEST ANSWER: If you click on the image it gets larger. I saw tiny flecks of green. The rug was a little large so I gave it away; I'm judging from the pictured rug but the green marks are very tiny; not readily discernable if you are trying to match the burgundy and tan only. Measurements: Which number indicates the length (first or second)? BEST ANSWER: Thank you for your question. The large number for the rugs is going to be the length, and the smaller number will be the width of the rug. We hope this information will be of help to you. Is there any possibility of getting chocolate brown braided rugs? You seem to carry every color but. I'd order in a heartbeat if you did. I like them because they are reversible and don't have that awful tacky rubber backing on them. Please make my day and locate some for me? BEST ANSWER: Thank you for your question. 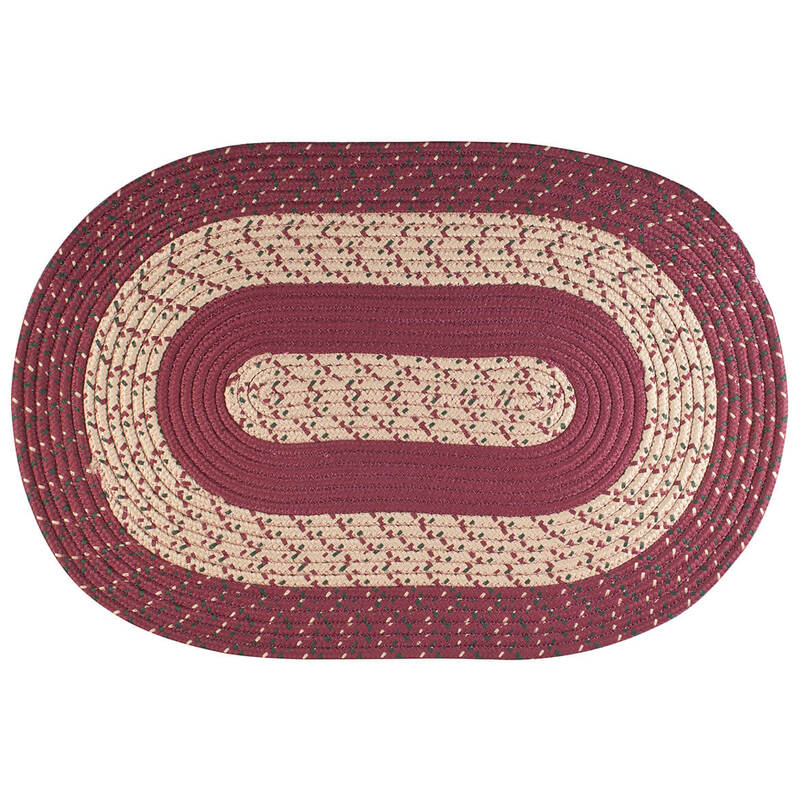 The oval braided rug only comes in 5 colors, burgundy, hunter, wedge wood, navy and sage. We hope this information will be of help to you. 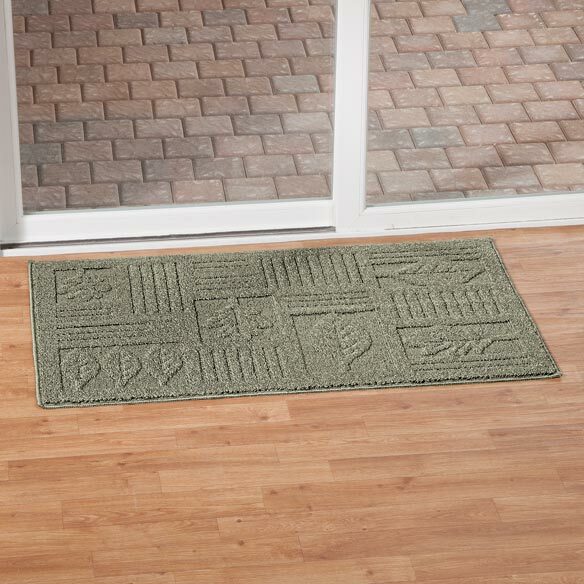 Artful, casual and fun— bright, durable 40 x 20 accent rug lends style and comfort to kitchen or entryway. 100% nylon, non-skid latex back. Machine wash cold; tumble dry low. 40" long x 20" wide. Imported. 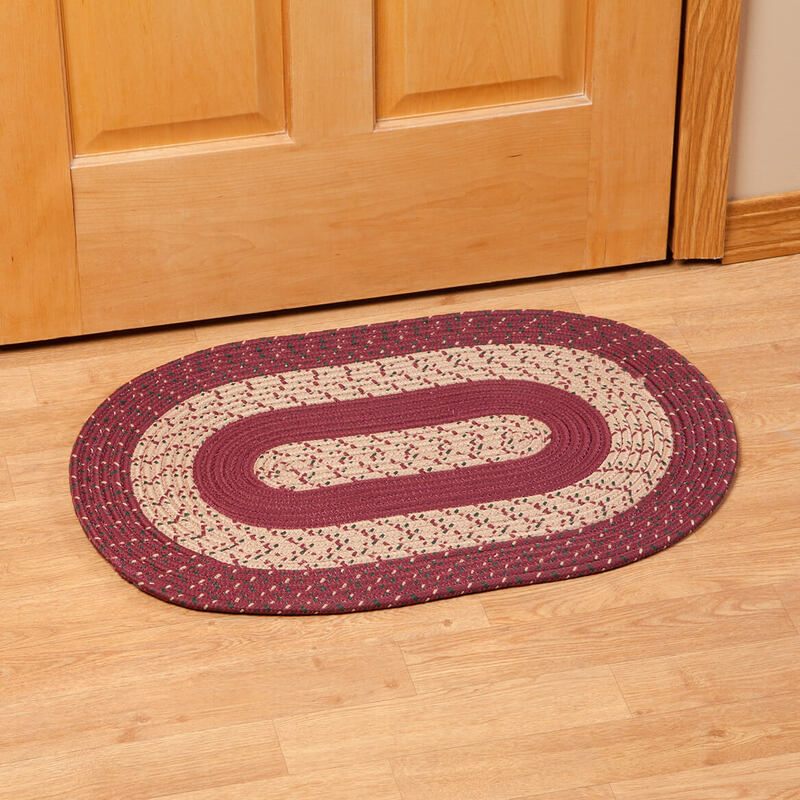 Offering rich color and texture to enhance any room, our stylish floral border rug offers soft comfort underfoot. 100% nylon with finished edges and non-skid latex back; machine wash and dry. Imported.